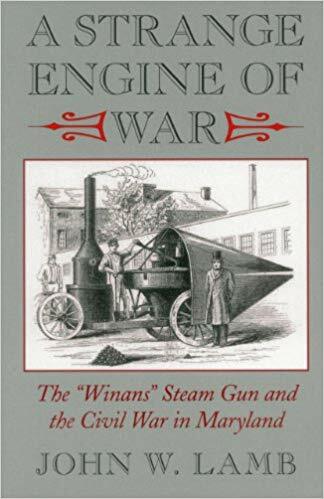 I would have bet money that you couldn't get an entire book out of the invention known as the Winans Steam Gun but John W. Lamb proved me wrong. Mentioned in several Civil War books as an oddity, the steam gun never saw combat with either side. The machine held much promise for its ability to sling 2-ounce projectiles (about the weight of a minie ball used in rifle muskets) at the rate of a modern machine gun. With that being said, the machine had drawbacks... for instance, its unmistakable appearance on a potential battlefield and some difficulty in changing azimuth and elevation settings. Much of the book is taken up with the people who actually invented, built and demonstrated it and the odyssey of the prototype, from the mysterious goings-on in Baltimore to an attempted clandestine trip to deliver it to Harper's Ferry (within striking distance of the Rebels) to its delivery by the Union Army to Fort Monroe. Nothing seems straightforward in this story but Lamb does his best to straighten it all out. Includes contemporary images of the machine as well as places and persons involved with it.